Where: 913 E. Sharp Ave.
Those ice cream cups – dreamy, creamy, bright and tangy – are the stuff of childhood. Orange sherbet and vanilla ice cream are swirled together in plastic cups that come with a charming, kid-sized wooden spoon. It’s the same concept in classic Creamsicle Popsicles – and a one-time cupcake dessert at Clover. After three years off of the menu, Clover has returned its Creamsicle-inspired cupcake to the dessert line-up for spring and summer. 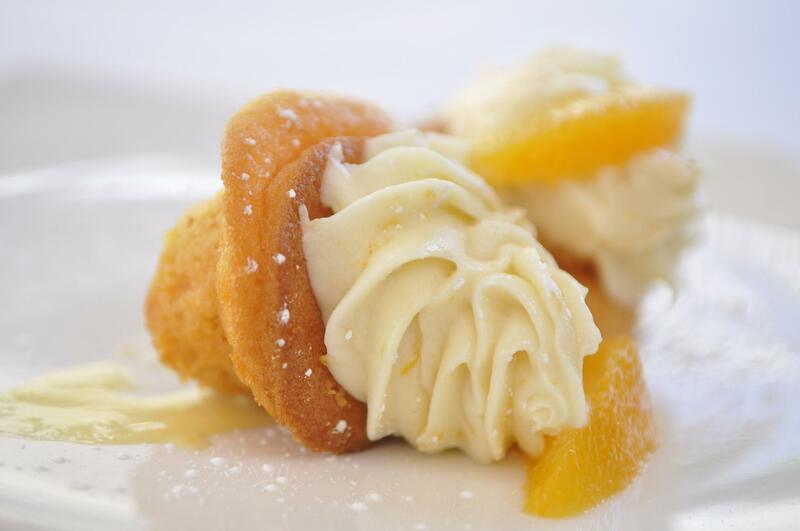 The moist and sweet vanilla-and-orange dessert had been a staple on Clover’s dessert menu during its first three years. It boasted a trifecta of orange flavor – in the cake, frosting and fresh fruit. Now it’s back. And its secret ingredient – and the source of that moistness – might surprise you. Mayonnaise keeps the cake nice and moist with a tender crumb. It makes sense when you think about it. Mayonnaise is egg and oil, and cake needs fat. The vinegar in the mayo punches up the orange flavor, too. But just a little. You’re not overpowered with acidity by any means. Mayo was a common ingredient in cake – particularly chocolate – during the Great Depression and World War II when eggs and butter were expensive or difficult to obtain. The substitution is a testament to home cooks’ resourcefulness during lean times and food rationing. And the result was – and remains – moist, rich and tender whether the cake is chocolate or orange. This recipe isn’t the restaurant’s exact execution. Clover uses house-made mayo and specific vanilla beans. But it comes from Liz McCandless, who owns the restaurant with her husband Scott. It’s geared toward home cooks but still captures the essence of that nostalgic orange-and-vanilla cup. Make the cake: Preheat oven to 350 degrees. Grease sides and bottom of a 13-by-9-inch pan, and flour lightly. Blend all wet ingredients. Add dry mix and beat on medium for 2 minutes. Pour into pan. Bake 24-27 minutes. Let cool before frosting. Additional bake times: For 24 cupcakes, bake 15-18 minutes. For 13 large cupcakes using rubber molds, bake 20 minutes. Or, for two 8-inch cake pans, bake 26-29 minutes. And, for two 9-inch cake pans, bake 24-27 minutes. Make the frosting: In a stand mixer, on medium speed, blend together until smooth the cream cheese and butter. Add sour cream, vanilla, vanilla bean scrapings, orange zest and extract, and blend until well-incorporated. Finally, slowly add powdered sugar until all is blended smooth. Garnish cake or cupcakes with fresh orange slices. Published: May 21, 2018, 2:32 p.m.